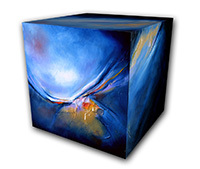 Visual artist Paul McCloskey was born in Carrickmacross, Co. Monaghan and is now living and working in Gorey Co. Wexford. Paul attended the National College of Art and Design (N.C.A.D) Dublin from 1981 and graduated in 1986. Paul also attended De Montfort University UK and was awarded a Masters Degree in Fine art painting (MFA) in 2010. Paul is a professional member of ‘visual artists Ireland’. He has exhibited extensively both nationally and internationally throughout the UK, London, Venice and New York and he has received many awards for his work, which can be seen in numerous collections. My most recent paintings ‘The Omega (awakenings 3d)’ builds on my previous series ‘Awakenings (The Alpha)’ and ‘Awakenings Reloaded’ this is the third in the trilogy of the awakenings theme. 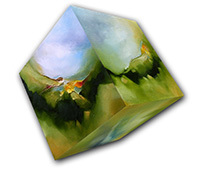 They consist of a number of 15 cubes, 10 of which are wall mounted and 5 of which are suspended at varying heights from the ceiling, allowing the viewer a full 360 degree view of the works, also inspired by the landscape, what we perceive as everyday and perhaps ordinary, the places we merely glance at without allowing ourselves to get lost in the breathtaking creation and beauty that surrounds us. 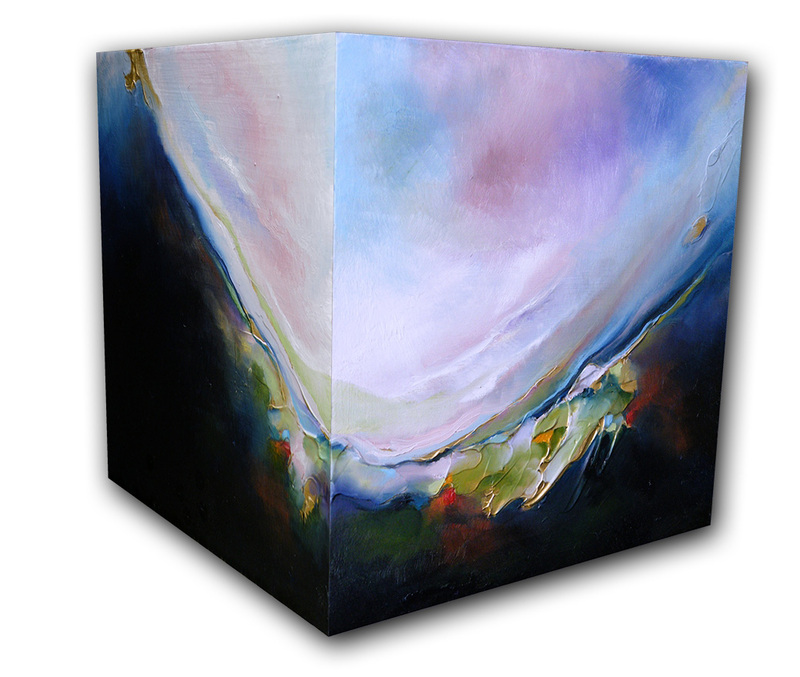 This visual influence is determined by the surrounding landscape of my environment, but its intention is primarily as a catalyst in expressing divinity and is therefore secondary to this expression, the primary purpose being process, allowing and presence. 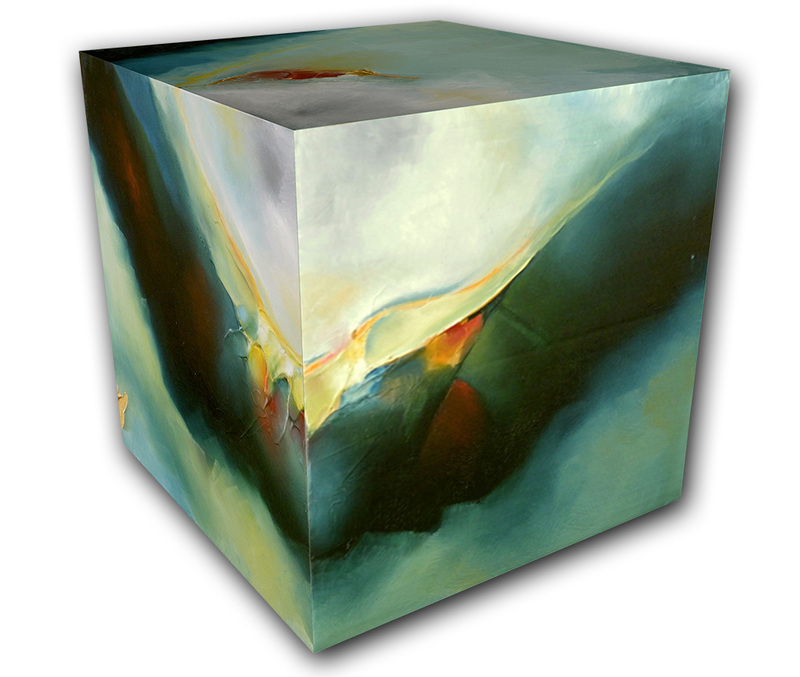 Also the cubes question and challenge the staple of painting being confined to the two dimensional surface, pushing the boundaries into the third dimension. 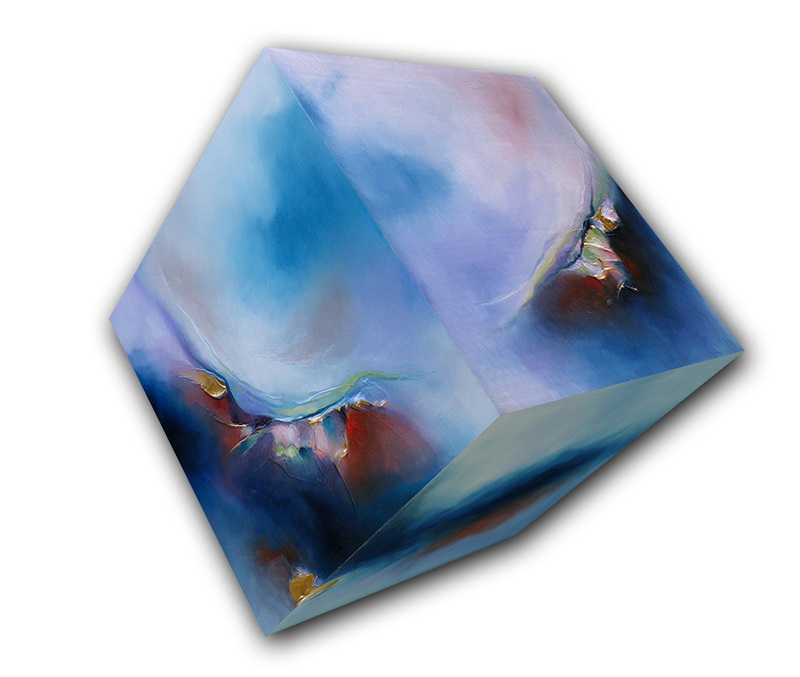 The cubes suggesting the dichotomy of spirit, being all things in all directions at once and is also a more literal translation of the work of post impressionist painter Cezanne and the subsequent Cubist movement, however the painted surfaces of my work has more in common with the Romantic philosophy , in particular that of Turner. In areas, sky and earth are as one, evoking the sense of personal growth, the sense of awakening to the beauty, divinity and perfection, to the divine order within all things. This suggestion of heaven and earth in constant struggle, merging yet separable, solid yet amorphous all suggest the multidimensional nature of the spiritual, the beginning and the end, the alpha and omega, the struggle within, between the conditioned self and the divine/spiritual self. • Monaghan County Council, art collection. • Wexford County Council, art collection. • As well as numerous private collections throughout the country. • 2013 – September 19th – 23rd October – ‘Ireland in our eyes’, London Irish Centre, Camden Sq, London. • 2013 – “Clouds” –August (2013) - Centro Storico /The Palazzo Ca' Zanardi, Venice, Italy. • 2013 – July 25th -Sept' 10th -2013 -‘The Story of the Creative’, (invited artist) See | Exhibition space, 26-19 Jackson Ave. Long Island City NY 11101 New York. • 2011/12/13 - Mealy's/SCOOP Contemporary art exhibition. 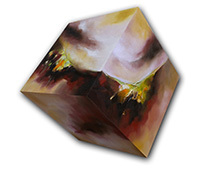 • 2012 - 'All sorts' - Sweetshop Gallery of contemporary art, Rosslare, Wexford - Invited Artist. • 2011 - 'Splash' - Back Loft, La Cathedral Studios, Dublin - Open submission. 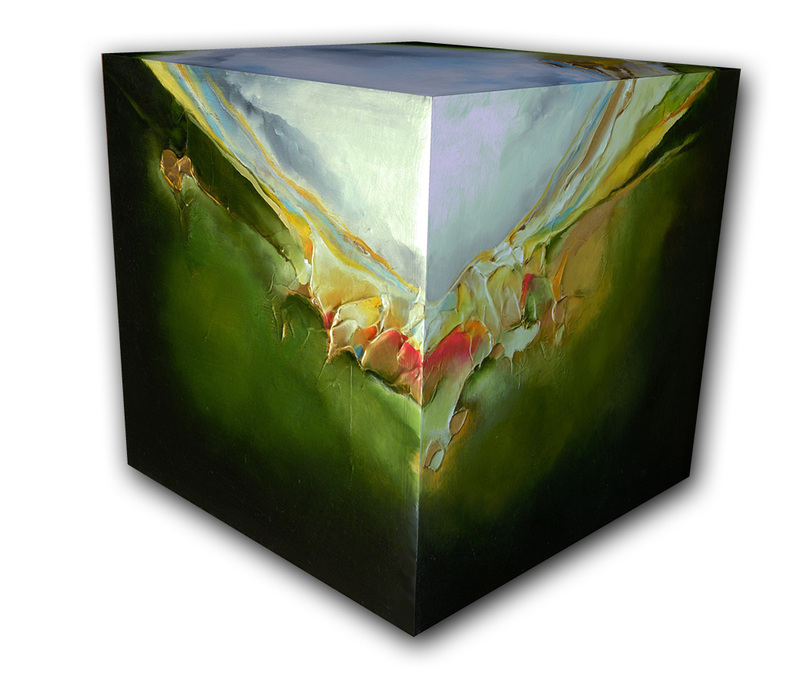 • 2011 – 'Harvest' – Hive Gallery and Studios – Waterford – Open Submission. • 2011 – 'Pink Pink Pink' - Mad Art gallery and Studios-Dublin- Open submission. • 2009 - Gallery Show – Henry Gilmore Gallery - Belfast. • 2007 - ’08 - Group Show - Art Upstairs - Rosslare. 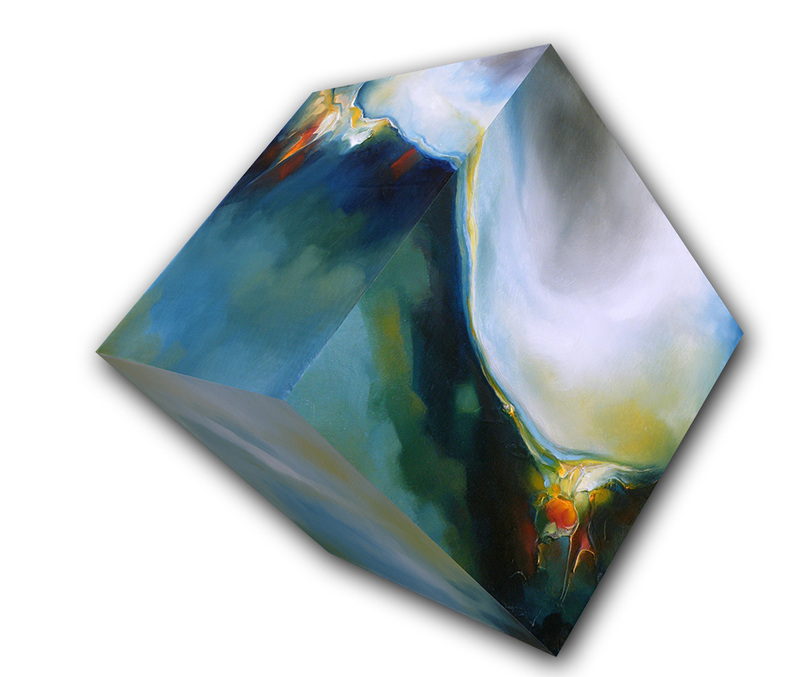 • 2006 - ‘07 - Salon Exhibition - Montserrat Gallery of Contemporary Art - New York. • 2004 - "Eigse - Carlow arts festival - open selection. • 2003 - "East meets West" Invited artist Carrickmacross Co. Monaghan. • 2002 - "Eigse - Carlow arts festival" - Open selection. • 2001 - "Wexford Opera Festival" - Wexford Arts Centre (Invited Artist) (2 person show). • 2001 - "Group Show" - Taylor Gallery Belfast. • 2001 - "Scenes before the eye" Agora Gallery (2 person show) Broadway, Manhattan, New York. • 2000 - "Comhairle Bhaile Cheanntair" (solo show)(Public works) Carrickmacross, Co. Monaghan. • 2000 - "CELTIC CONNECTIONS" - (The Arts Council Ireland.) (A Welsh/ Irish exchange exhibition of four short listed artists) Fishguard Wales. • 1994 - "Lough Derg" (Kavanagh heritage centre Monaghan) Permanent collection. Paul McCloskey of Gorey, County Wexford, Ireland, presents several (5) strong oil paintings. Of particular note is "Awakenings Reloaded Blue Gold" (special recognition award) wherein the contrast of open space with a concentration of painterly quality is visually delicious. This effect is also powerful in "Awakenings Reloaded with Violet"(special recognition award). Moreover, his three-dimensional work "The Omega (Awakenings 3D) Violet"(special recognition award) is quite rich. Juror - Laurence Bradshaw, Curator, Professor of Art and Art history at the University of Nebraska. Oil on Canvas 61" X 61"
Paul McCloskey combines a very spatial atmosphere combined with a minimal use of warm colour, offset by the cooler overall palette. The form and perspective of the piece is very daring with its tilt and gives the feeling of falling into the piece. McCloskey combines a heavy mechanical or metallic patina of the foreground shape with the background which is open and atmospheric which contradicts on one level but becomes congruent on another. Mark Roden and Joana Esteves, founders of JOMAR VISIONS, Houston Tx, USA.